Sony HDR-XR160 Handycam camcorder records stunning 1920 x 1080 Full HD videos. It features an "Exmor R" CMOS sensor for superior low-light performance and wide angle Sony G lens to take in more of the scene, plus 42x extended zoom for getting you closer to the action. Also equipped with a hard disk drive (HDD), you can record and store up to 54 hours of high-definition video footage (HD LP mode). Talking about editing AVCHD video footage on Final Cut Pro, it’s not that perfect as we imagined. Final Cut Pro 6 claims to give full support for Sony AVCHD (*.mts, *.m2ts) format, but many people including our customers have experiencing enormous troubles about handling AVCHD clips on FCP. 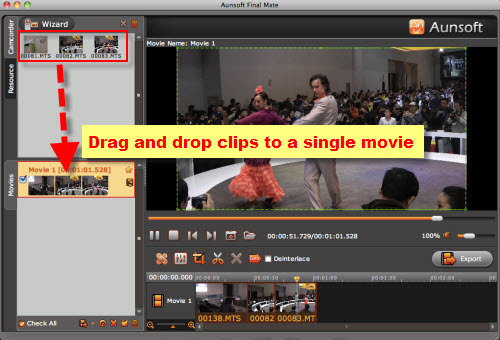 For easier and more convenient handling camcorder footage for Mac users, Aunsoft Studio has developed Aunsoft Final Mate for Mac. How Aunsoft Final Mate for Mac help FCP users? This guide will tell you how to convert Sony XR160 AVCHD MTS to ProRes for smooth editing in Final Cut Pro without rendering. There are two ways to import videos to Aunsoft Final Mate for Mac: you can directly capture video recordings from camcorder to the program or you can browser videos from your computer. - Capture Sony XR160 AVCHD videos from camcorder. Connect camcorder to computer via USB cable, and then launch Aunsoft Final Mate for Mac in Application folder. With built-in wizard, you can easily to capture mts video files from XR160 to the program. Select “Import” instead of Backup to quickly capture videos from camcorder. You can find imported videos under Camcorder tab in the main interface of Final Mate. - Import Sony XR160 mts videos from computer. If you have already backup all your video recordings from XR160 to your computer, you can browse your video path and the software will automatically show your AVCHD clips in Resource tab. Click the drop-down button of “Add Movie” icon and choose “For Conversion” to create a blank movie. Once you’ve imported your video footage, drag and drop the video clips from Camcorder Tab (imported from your camcorder) or Resource Tab (imported from your computer) to the blank movie in Movies Tab. In this way, all video clips will be merged as one single movie for conversion. Click the Export button and choose “Export into Editor”. 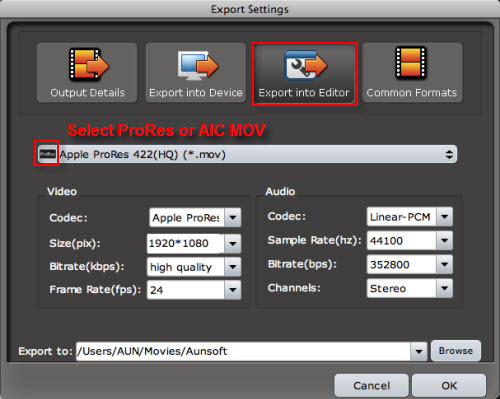 Follow Final Cut Pro> Apple ProRes 422 HQ (*.mov) to choose export format for further editing in Final Cut Pro. Or you can also choose QuickTime Movie Format > Apple Intermediate Codec (*.mov) for editing in FCE/iMovie. Click OK to start converting XR160 MTS files to ProRes MOV. Click Ok to confirm your settings and start conversion. When the process is done, you can directly import the exported Sony XR160 ProRes MOV movie to FCP for editing without any rendering and make your great home movies. It’s that easy! 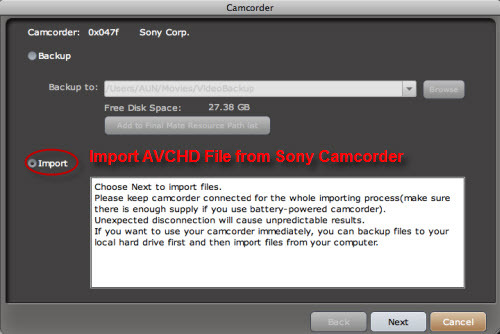 You may also want to know how to convert AVCHD to Apple Intermediate Codec for iMovie/FCE or merge AVCHD without re-encoding to preserve original quality.